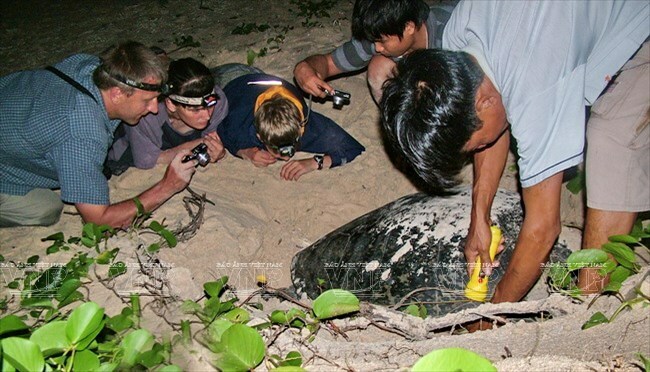 Ba Ria-Vung Tau (VNA) – Con Dao National Park in the southern province of Ba Ria-Vung Tau has been working hard to conserve sea turtles for years, becoming an ideal nesting destination for the rare species in Vietnam. Con Dao beaches are nesting sites of the biggest number of green sea turtles in Vietnam. Data show that about 350 mother turtles have nested here. The national park is the first in the country to have successfully carried out a sea turtle conservation programme, beginning in 1994. It has studied the animals’ behaviour and worked out effective conservation measures for not only Con Dao but also beaches nationwide. There are six turtle conservation stations on the islands of Con Dao National Park, managing 16 nesting grounds. Almost 81,140 baby turtles have hatched at these stations and been released into the sea so as to minimise the rate of those attacked by predators on beaches or littoral zones. In 2018, the nesting season of sea turtles was from late January to mid-November while the egg laying period was from May to November. Nguyen Van Vung, a staff member of the marine and wetland conservation division at the park’s management board, said rescue and conservation activities have been carried out successfully. Con Dao has become a sea turtle research and conservation centre with the biggest numbers of turtles nesting, eggs laid and baby turtles released into the sea in Vietnam. Management and examination have been enhanced to fight violations of turtle conservation regulations, thus reducing the theft of turtle eggs and the poaching of mother turtles, he noted. 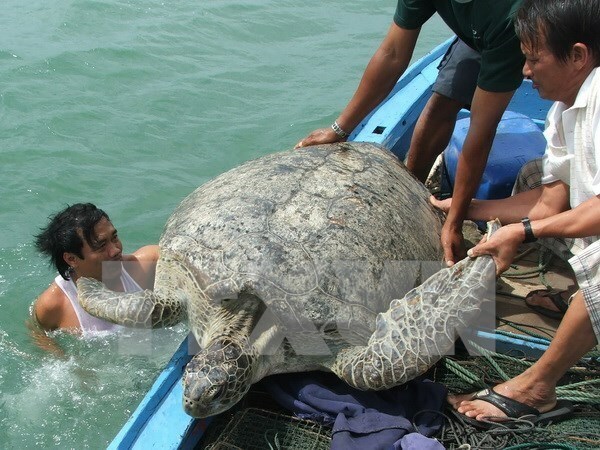 Last year, the Con Dao National Park handed over 500 turtle eggs for incubation at the Cu Lao Cham Marine Protected Area in the central province of Quang Nam under a license of the provincial Ba Ria-Vung Tau People’s Committee. Its management board worked with the International Union for Conservation of Nature (IUCN) to run a summer volunteer programme. Volunteers helped conservationists relocate nests, protect nesting sites and carry out communications to raise visitors’ awareness during the peak travel season. With the local administration’s permission, the park has also worked with the Con Dao Resort Co. Ltd to recover and preserve the nesting ground on Dat Doc Beach between 2018 and 2020. It has provided management, rescue and conservation training to the firm’s staff, transferred 41 sea turtle nests to this beach and worked to restore the grounds. Six mother turtles have nested in this area, and almost 2,490 baby animals successfully hatched and were released into the ocean by the company.